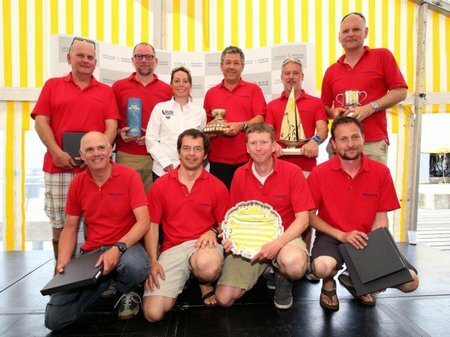 The delighted skipper, Giovanni Belgrano (centre) and his crew of WHOOPER, IRC Division 3B, Winner of IRC Division 3B, the BCYC TROPHY – First BCYC Yacht, the CHAMPAGNE MUMM CHALLENGE CUP – First Overall IRC Group 3 and the GOLD ROMAN BOWL & J.P. Morgan Asset Management SALVER – First Overall IRC – with Helena Lucas MBE. IMAGE: Patrick Eden. 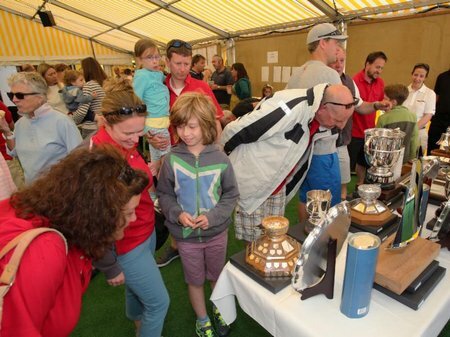 Hundreds of happy competitors gathered at the Island Sailing Club (ISC) in Cowes today to celebrate another successful J.P. Morgan Asset Management Round the Island Race, the 84th edition, held yesterday, 27th June, 2015. The annual Prizegiving event, superbly managed by the team at the Club, was introduced by the ISC Commodore Mark Wynter and then, after an introduction to the special guest, Paralympic sailing Gold medallist Helena Lucas MBE, the team moved briskly through the presentation of trophies and salvers plus Race Partner prizes, with Sailing Secretary Chris Thomas co-ordinating proceedings on-stage with the Rear Commodore Sailing and Race PRO Mike Peskett. Admiring the trophies at today’s RTI Prizegiving at the Island Sailing Club. Dave Atkinson, speaking on behalf of the ISC Race Management Team, commented that yesterday’s race provided a classic Round the Island Race day for the ISC’s Race Management team including around 120 volunteers and the 15,000+ sailors taking part. The ISC is delighted that every one of the 1389 boats that finished were across the line before the scheduled 2200 cut off in order to qualify for a result. From the initial 1584 entries, there were 104 retirements and 11 OCS/DSQ. Thousands of spectators in Cowes and around the Isle of Wight as well as on the mainland, including at the Race HUBs at the Royal Southern YC in Hamble and the Royal Lymington Yacht Club, enjoyed fabulous views – this year for the first time including via the RTI TV channel. This new initiative, launched by the ISC and J.P. Morgan Asset Management and some Race Partners, provided live commentary and footage of the starts interspersed with competitor interviews and weather information. Next year’s J.P. Morgan Asset Management Round the Island Race will take place on Saturday July 2, 2016. 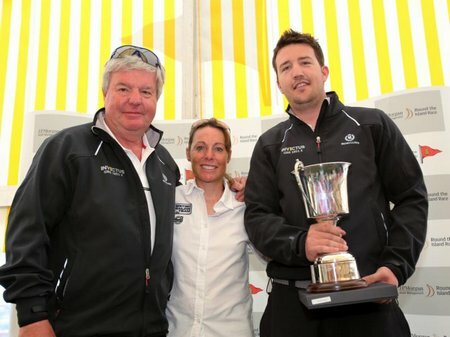 Sir Keith Mills, Helena Lucas MBE and Alex Mills from INVICTUS, IRC Division 0, Winner of the J.P MORGAN TROPHY – First Overall IRC Group 0.